Product Description: Vital HGH with Human Growth Hormone Revitalizing. Feel your energy return, enjoy a healthier balance to muscle - and benefit from better sleep too! VITAL HGH is a breakthrough two sprays, three times a day sublingual homeopathic spray that brings scientific insight to the time- honored traditions of natural treatments. Vital HGH with Human Growth Hormone rebalances growth hormone produced naturally by the body (which diminishes dramaticall's we age) making it possible to treat the symptoms of aging from the inside out. 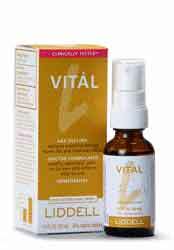 VITAL HGH is supported by five months of clinical testing proving its effective ness, and safety. Relieves these symptoms of aging and/or a run-down condition: low energy, poor muscle ma, excess fat, occasional sleeplessness. Suggested Use: adults Only. Spray twice under the tongue three times a day. Hepar 3X, Human growth hormone 30X, PituitarUM 30X. (Symptom relief of aging or a run-down condition). Purified water, Organic alcohol 30% v/v.